The garment industry turns over almost $3 Trillion a year. Yet garment workers, 80% of them women, work for poverty pay, earning as little as $21 a month. Human rights abuses are systemic throughout the industry. Poverty wages, long hours, forced overtime, unsafe working conditions, sexual, physical and verbal abuse, repression of trade union rights and short term contracts are all commonplace in the clothing industry. It is an industry built on exploitation and growing under a lack of transparency that makes holding brands accountable difficult. We are dedicated to changing this. Poverty wages, long hours, forced overtime, unsafe working conditions, sexual, physical and verbal abuse, repression of trade union rights and short term contracts are all commonplace in the clothing industry. We raise public awareness and promote collective action from consumers to push for change in the industry. We pressure companies to take responsibility for worker’s rights throughout the entirety of their supply chains. We work with trade unions worldwide to amplify garment worker’s demands. We lobby governments and policy makers to legislate and protect garment workers human rights. The focus of our work comes from garment workers themselves, and we provide a platform to amplify their voice and demands and to promote international solidarity. Labour Behind the Label believes that no-one should live in poverty for the price of a cheap t-shirt. That a living wage is a basic human right, as is working without fear for your life. We are committed to making these ideals a reality in the garment industry. Labour Behind the Label is the only UK campaign group that focuses exclusively on labour rights in the global garment industry. Founded in 2001, we have 17 years of experience in awareness raising, research and lobbying in support of workers demands for improved pay and conditions. We are small but mighty in relentlessly raising the profile of garment workers who need their stories to be told. 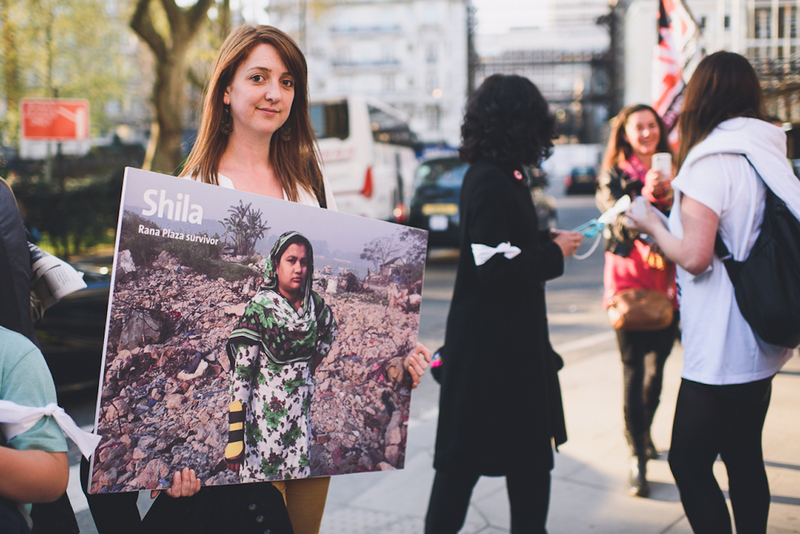 Our effective campaigning has been instrumental in pushing UK retailers to sign the Bangladesh Accord on Fire and Building Safety, ensuring Rana Plaza victims receive long-term compensation, supporting workers in Indonesia to receive legally-owed severance pay, and campaigning with Cambodian garment workers to demand a living wage, among many other cases. We are a workers cooperative based in Bristol. We represent the Clean Clothes Campaign in the UK and work with over 250 partner organisations worldwide through this network. In the UK we work with a variety of partners, such as other NGOs and trade unions, to ensure our campaigns have the greatest impact. Read the 5 ways we help. Please help support our vital work. Donate now. Want to know more about our work and why your support is so valuable?